When Harlem Township in Delaware County, Ohio took control of a cemetery dating back to 1830, they needed to make sure they had as much information about what was under the ground as possible. 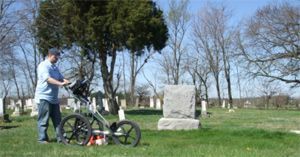 The township government decided to use Ground Penetrating Radar Systems and Nate Kollar from the Columbus, Ohio office to create a map and give the trustees important data to help them best serve the families of those buried in the cemetery. Using a Ground Penetrating Radar 400MHz antenna with a maximum effective range of 3.5 meters GPRS was able to accurately report that there were no unknown graves on the site. GPRS was also able to locate the direction of grave sites marked with headstones. Nate Kollar runs GPRS operations in the Greater Cincinnati, Columbus and Dayton, Ohio region including Indianapolis and Southern Indiana, all of Kentucky and West Virginia. He is based in Dayton, Ohio and he can be reached at (937) 604-7802 or by email at nate.kollar@gprsinc.com. Cemetery mapping and grave site location and verification is a common service performed by the Ground Penetrating Radar technicians at GPRS.